Efforts to rehabilitate the vast numbers of wounded veterans did not always succeed. The conversion of a prison farm to a hospital was doomed to fail. Not all hospitals for veterans were as sanitary and comfortable as the one pictured here. Many soldiers returning home from the front lines of Europe suffered from chronic illnesses, such as tuberculosis. Approximately 138,000 Canadians were classified as ‘battle casualties’ during the First World War. The Canadian government established the Military Hospitals Commission (MHC) in June 1915 to prepare for the inevitable influx of wounded soldiers returning home. The MHC procured hospitals across Canada to provide medical care to these veterans. At the same time, it made arrangements with the provinces to find employment for the men. Those unable to resume their prewar occupations, due to illness or injury, were eligible for vocational retraining in occupations compatible with their abilities. By 1917, the MHC was supervising over 115 institutions across Canada and assisting nearly 12,000 veterans. This article examines one such institution, Speedwell Military Convalescent Hospital in Guelph, Ontario. Speedwell was part of a nationwide soldiers’ civil re-establishment program intended to neutralize the social and economic dangers associated with demobilization. The top priority of the MHC and its institutional successor, the Department of Soldiers’ Civil Re-Establishment (DSCR), was the vocational training of soldiers to be obedient industrial workers. This philosophy was shared by the DSCR’s medical directors and influenced their medical practices. As the health of individual veterans became closely associated with the wellbeing of the national economy, the ultimate goal of the hospital became more than physical and mental recovery: sick and wounded veterans would be transformed into healthy and productive workers. The particular nature of an institution influenced how veterans experienced these national re-establishment policies. The MHC’s decision to occupy Speedwell reflected a widespread belief that engaging in profitable labour and securing economic independence could have significant rehabilitative effects on certain disaffected social groups. This belief in vocational rehabilitation extended to the reform of young criminals, to the re-establishment of soldiers, and even the treatment of tuberculosis. All three groups passed through the halls of Speedwell Hospital in the first two decades of the twentieth century. 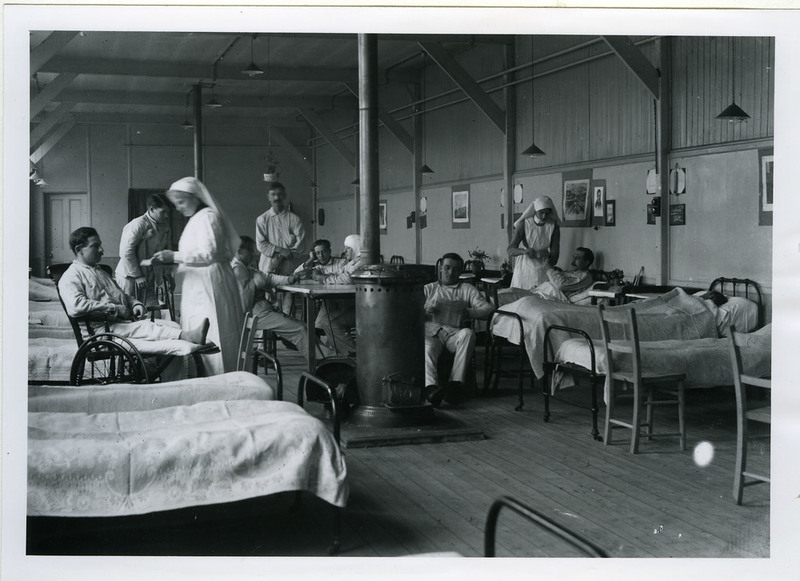 Nursing Sisters oversee soldiers learning to knit as part of their rehabilitation. There was a strong belief that vocational training of mentally or physically wounded soldiers would turn them into obedient and productive workers. Speedwell was constructed a few years prior to the Great War to serve a very different purpose. Between 1909 and 1916, the Province of Ontario invested about $1.2 million in the construction of a state-of-the-art ‘prison farm’ on the outskirts of Guelph, complete with farmland, livestock, and several industries. The Ontario Reformatory was uniquely designed to test new ideas about crime and punishment, specifically the belief that performing meaningful labour during incarceration could rehabilitate non-violent inmates while simultaneously reducing the financial costs associated with their imprisonment. This vocational philosophy was similar to the MHC’s philosophy regarding veteran re-establishment. to specialize in the vocational training of nearly-recovered veterans — men who were healthy enough to work on its farms, in its industries, and in the quarry and abattoir, thereby developing important skills for future employment. What Speedwell became was something quite different because of its unique institutional characteristics. It was a provincial government property and demands were placed upon the MHC to continue supplying the Province of Ontario with goods manufactured in the prison industries, without the benefit of cheap inmate labour. A business-minded assistant director with close ties to the Provincial Secretary’s Office was granted vast administrative powers. Together, these factors prevented the MHC from fulfilling its vision of turning Speedwell into the ‘chief educational centre’ for wounded veterans. The needs of DSCR patients changed after the war ended. Those soldiers with acute war-related injuries, such as gunshot wounds or fractured limbs, had largely recuperated and returned home by the middle of 1919. Those who remained were typically chronic invalids, many suffering from debilitating diseases such as tuberculosis. Speedwell transitioned to a large sanatorium for the treatment of tuberculous veterans. No longer would short-term, relatively healthy veterans pass quickly through the former prison while working in the fields and factories. After June 1919, the tuberculous patients sent to Speedwell had to endure extended periods of recovery, sometimes lasting months or even years, in an institution unsuited for the treatment of tuberculosis. On May 12, 1920, Speedwell’s nursing staff walked off the job. The Toronto Evening Telegram published a series of articles on July 7, 1920 about the state of affairs at Speedwell. Miss A. Hanlan reported having to use rusty hypodermic needles which the nurses sterilized with boiling water in the lid of a tin can. Another nurse, Miss Folley, denounced the ‘private wards’ fashioned out of the former prison cells. The limestone walls were poorly insulated and dripped with condensation in the spring and fall. The nurses claimed hospital officials consumed alcohol and gambled while on duty, and revealed to reporters the recent death of a nursing sister from pneumonia. The nurses charged Dr. Urie with neglect. It was also revealed that a petition, signed by 150 patients, had been presented to Dr. Urie on June 17, 1920, which demanded conditions improve at Speedwell. In August, the Province of Ontario released its own report on Speedwell. The report was conducted by Mr. J.J. Bayliss from the Mountain Sanatorium in Hamilton. Bayliss visited Speedwell in July to investigate the accusations published by the Telegram. His report of August 2, 1920 concluded that Speedwell had failed to sufficiently transition from a prison into a sanatorium, and this failure had significant psychological implications for the patients. Fear of tuberculosis amongst the Canadian public had prompted demands for the establishment of prison-like ‘colonies’, wherein those suffering from tuberculosis could be contained during treatment. “[I]n such a colony,” claimed Bayliss, “the discipline, while not as strict as that of an ordinary prison, would still be strict enough to enforce obedience on the part of a patient for the protection of the public at large [...] Speedwell fitted the idea exactly.” The patients resented the idea of being locked away because of an illness contracted while fighting overseas. To make matters worse, some of the prison cells remained in use for patients who “acted up a little.” It was Bayliss’ opinion that Speedwell’s tubercular patients were suffering. In late August, the DSCR’s Medical Director ordered all tuberculous patients removed from Speedwell. On September 29, 1920, Order-in-Council #P.C. 2338 instructed the DSCR to vacate the hospital and return the Guelph Reformatory to the Province of Ontario. Speedwell’s administrators were tasked with implementing national re-establishment policies while contractually obliged to the Province of Ontario, which had different priorities. It is unknown if the veterans’ experience at Speedwell was the exception or the rule. Nevertheless, Canada’s soldier re-establishment program, formulated by the MHC in Ottawa but implemented by the hospital’s director in Guelph, failed to provide the quality of medical care and vocational training that Canada’s Great War veterans deserved.